If you invest in fundamentally strong small and mid cap companies with a medium to long term horizon, you will get rewarded for sure that too in a big way. Wim Plast Ltd (BSE Code: 526586) is classic example of "Buy Right and Sit Tight" strategy. Our equity analysts published Hidden Gem - Aug 2011 research report and shared it with all Hidden Gems members 6 years back on 30th Aug 2011. Hidden Gem stock - Aug'11 - Wim Plast Ltd was recommended at price of Rs. 92.50 (bonus issue adjusted price, actual average recommended price was 185) with target price of Rs. 215 over period of 1 to 2 years which was achieved sooner than later, however we suggested our members to continue to hold it and add more on dips considering strong fundamentals and reasonable valuations. In 6 years, stock has multiplied investment of our Hidden Gems members by almost 16 times. Wim Plast share price closed at Rs. 1461 today giving absolute returns of 1480% since our initial recommendation. We kept on advising our members to add this stock in their portfolio at higher levels during last 5 years for long term wealth creation post our initial recommendation in 2011. Last year, management rewarded shareholders by issuing bonus share in the ratio of 1:1. Issue of Bonus share is a good move by company which indicates that company is Investor friendly and also shows the confidence of management in future growth outlook of business. We believe Wim Plast is well positioned to deliver robust top line and bottom line growth in coming quarters. Stock at current price looks fairly valued, however any significant correction in stock price must be considered as buying opportunity by long term investors. Wim Plast is a zero debt company promoters holding of 72.59%. Company is maintaining operating margins above 17% since last 5 years and is taking all right steps to deliver consistent growth. In last five years, Wim plast have shown healthy CAGR growth of 9.6% and 16.4% in Revenue and PAT, respectively. ROE is 22.7% in last 5 years, which is impressive for such a small cap company. Wim Plast continuously introduced new range of products to drive revenue growth and profitability in past. Company has strengthened its brand equity of ‘cello’ branded products throughout country and has been continuously increasing the ad spend. Company has launched new models for its product range including various new designs. Another prominent brand of the company ‘Cello Bubble Guard Sheets’ has gained rich response from the users for applications like Tile Protector, False Ceiling, Wall Panel and Packaging materials in past. In plastic furniture segment, Wim Plast is the third largest manufacturer after Nilkamal and Supreme. Among listed players, Wim Plast has an edge over its peers by reporting better margins. Balance sheet has remained strong for the company as it has zero debt in its balance sheet. Strong operating cash flows enable the company to remain debt free and fund the expansions through internal accruals. India air cooler market is growing with a CAGR of 11.26% from last four years and market is projected to grow further due to rising mercury, increasing disposable income, growing demand in middle class people and low price of air coolers as compared to air conditioners. India air cooler market is divided into two parts viz. residential and industrial. Residential and Industrial air cooler market is growing with a CAGR of 15.68% and 9.04% respectively from past four years. Keeping in point, low capital expenditure and electricity benefits of air coolers, the middle income group majorly fuelled the sales in residential market. Whereas, industrial cooling is slowly gaining increasing importance as corporate are now looking to create an amiable working environment for their employees. The Indian air cooler market size is estimated to be around Rs 3,000 crore in value term and around 30% of this is in the organised sector and rest is catered to by the unorganised segment players. According to “India Air Cooler Market Outlook, 2021”, India’s Air Cooler market is anticipated to reach INR 8,000 Crore by 2021 from current estimated size of 3000 crores. There are an estimated 247 million households in India and about 65% own fans, while only 4% of these households own air conditioners and 8% own air coolers. High and rising temperature levels are leading to greater demand for cooling solutions. With rising incomes, cooling solutions are increasingly viewed as necessities. Considering lower cost of ownership vis a vis ACs (70% lower capital costs and 90% lower running costs) and the constrained power supply situation in India, air coolers are the mass market option for Indian consumers. So, the potential customer base for cooling solutions in India is huge. Symphony, Kenstar and Bajaj are the dominant players in the organized air cooler market. Voltas has also forayed into the industry and is expected to give fierce competition to the market leader Symphony. Room coolers account for almost two-third of the total market and is expected to dominate going forward, followed by desert coolers. North India caters to the largest revenue sales as the region is growing at a fast pace and the growth is fuelled by a shift from unorganized to the organized market. Symphony is the market leader. Symphony domestic sales in FY 16-17 was ~ Rs. 597 crores with nearly 50% market share in organized market, other players too grown from zero to over 15% share of the organised market in value terms in last 3 to 5 years. Wim Plast is the new entrant in air cooler market and already started selling its coolers under brand “Cello” with all major online retailers – Amazon, Flipkart, Snapdeal, Paytm and Pepperfry. 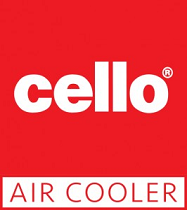 Various models of Cello coolers are launched in price range of Rs. 7,000 to Rs. 15,000 under Dessert, Mini Dessert, Personal and Window category with water capacity of 22 Litres to 60 Litres. Cello coolers are available in wide range with latest features to compete well with other major players to grab market share in organized air cooler industry. Cello Coolers TV commercial were already started by the company to position and market its products in this summer season. We have also seen Wim Plast coolers at supermarket stores like Hypercity and Big Bazaar in places like Mumbai and other metro towns. Wim Plast has history of strong brand positioning under brand Cello to market and sell its products in moulded furniture (plastic furniture and material handling products) and boards (false ceiling, wall panel, bubble guard sheet etc) category. We believe entry into air cooler business will augur well for the company in coming years as it will give a major boost in terms of revenue growth going forward. Below is the summary of Wim Plast Ltd - Hidden Gem - Aug'11 Research Report released on 30th August 2011.